For today's trip to upland Surrey, I'm visiting two adjacent attractions to the north of Dorking. When the Olympics came to London, there was really only one place for the cycling road race to go. 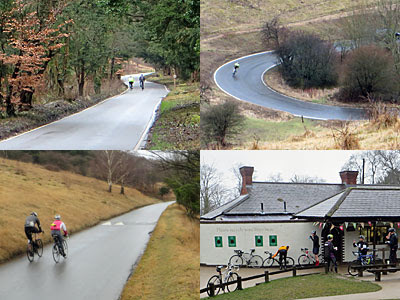 To Mole Valley, and more specifically to Box Hill, which provides the only sustainable steep climb in the South East. The peloton swept out of London to the midst of Surrey, toured Woking and Dorking, then passed several times round a hilly loop through undulating downland. And that repeated ascent started each time with an assault on the Zig Zag Road, a mile and a half of relentlessly steady incline from the A24 at the bottom to the National Trust cafe at the top. Normally you'd cycle here, obviously, but you could also catch the bus. 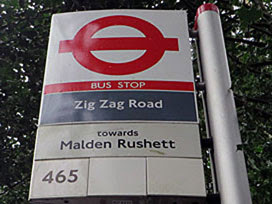 We may be four miles south of Greater London but the 465 bus still stops at the bottom of the road, serving little more than a T junction and a couple of cottages. There's little to indicate that this is the entrance to a strenuous bike-testing route. Indeed the first stretch looks almost ordinary, if at a gradient, climbing steadily through mixed woodland. There's no pavement, there doesn't need to be, so if you're an interloper on foot you often have to get out of the way. Both cars and cycles head this way, this also being the only road up to the NT car park, and hence the zig zag to make the summit attainable. The land rises up fairly steeply to either side, to the right being the Burford Spur, which is one of the favoured trails for hikers heading to the top. But so far, relatively straightfoward. At Zig One the forest opens out to reveal a precipitous tumble of chalk grassland. This is also where the National Trust's land kicks in, hence a sign saying Private Road, and a great big I [acorn leaf logo] Box Hill painted on the road to remind riders who's boss. Various footpaths converge at this bend, one of which scrambles straight up to allow ramblers to take a steep stepped shortcut. But I wanted to experience the cyclist's full climb so I stayed on the main road, or at least a narrow ledge-like path perched immediately alongside. An intermittent stream of cyclists passed by, generally in an upward direction, but occasionally a grinning freeloader freewheeling down. Most were in lycra of various levels of fluorescence, teeth gritted and an intense look of concentration on their face. Fifty metres done, and 'only' seventy-five more to go. Zig Two is extremely sharp, and it's important to turn else you end up careering down the drive of an extremely remote nursing home. There follows a full half mile without a turn, and soon noticeably higher up than the road previously travelled. Again this first part's footpathless, so it's important to get out of the way of any steely cyclist for fear of putting them off their stride. The view here is at its finest, towards Ranmore Common and beyond, with the land rapidly dropping away to reveal tiny cyclists making their assault a few minutes behind. This was the prime viewing area during the Olympics, on the expanse of open grassland above the road, leading down from the wooded ridge of Lodge Hill. Spectators got to watch the men ride by nine times, the ladies twice, and maybe sneak out and scrawl a message in chalk on the road. Then back into woodland, the view extinguished, for another spell where pedestrians aren't especially welcome. This is beech forest, with the floor to the right increasingly resembling a ravine, hence the need for another sharp bend at Zig Three to pass back along the other side. The road's now quite gentle compared to what's been before, indeed the whole thing's been fairly laughable compared to the most challenging Alpine stages of the Tour de France. But that's not to belittle the achievement of anybody pedalling to the top, many of whom can be seen parked up by the Box Hill Servery sweating over a cup of coffee. Alternatively they might go celebrate with cake in the National Trust cafe, much easier at this time of year when the place isn't packed out. And then it's either onwards via a great long loop to ride elsewhere, or straight back down to try again. Wheeee! You will not, I can guarantee, be as fortuitous with your visit to the largest vineyard in England as was I. The signs weren't good. 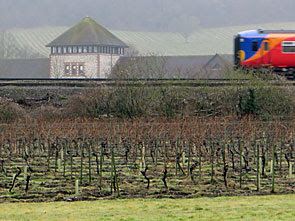 Denbies' vines don't look their best at this time of year, leafless and pruned back, plus it was raining all the way across the plantation and under the railway. Nevertheless the car park outside the winery looked remarkably busy, the shop and restaurant seemed to be doing a bustling trade, and Edward and Melanie's wedding was in full flow somewhere inside. I worried that the guided tour might be sold out, but quite the opposite, with only me and a couple of Groupon parties signed up. I plumped for the cheaper of the two options, which meant ordinary wine rather than sparkling fizz at the end, and prepared to hand over a tenner. Not so, apparently the 360° cinema had succumbed to a power failure so we'd skip that, and a sizeable discount was offered. If you have any romantic views regarding English winemaking, think again. The backroom tour involved walking past some giant metal vats, inside which some of last year's bumper harvest was resting, then standing almost beside the bottling machines. What made the experience special was the commentary by our guide, a splendidly direct lady with a sense of humour as dry as a Sauvignon Blanc. She explained the grape-gathering process with aplomb, and answered the group's questions without making it sound like she'd heard them all a dozen times before. She only ever referred to the chemical expert who tweaks the recipes as The Winemaker, and to the vineyard's owner as The Owner. He'd bought up the land in 1984 with the expectation of running a farm, only to be advised by The Geologist that the area's micro-climate would be ideal for wine-growing, and increasingly so as global warming advanced. Today one square kilometre is covered, representing 10% of all the vineyards in England, and only once (in 1993) has the harvest been seriously frost-damaged. The tour ends in the cellar, where you get to sample three glasses of whatever you signed up for at the beginning. I was especially fortunate in being the only one signed up at my price point, so got surreptitiously bumped up to the better wine to save them from opening more bottles. Some serious vinicultural talk ensued, with Goulden-esque adjectives bandied about and the vintage of each composition carefully explained. There was even the unexpected offer of a bonus wine, kindly taken, so that by the end of the underground half hour I'd downed four glasses of mostly-sparkling wine at a ridiculously knock-down price. You will not be this financially fortunate, I can assure you, but I wholeheartedly enjoyed my winery tour and its comfortingly bubbly afterglow. 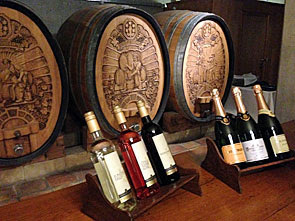 Over 60% of the vineyard's output is sold in the shop on site, including the world-beating Chalk Ridge Rosé which won an international Gold award in 2010. The Owner hopes you'll finish off your tour by purchasing several bottles, then stop for a meal in the restaurant, which it seems most people do. There's also a brewery on site, and a bed and breakfast, and a farm shop, all to ensure financial diversification should the harvest ever fail. Denbies certainly makes for a very different day out for the wino in your life, and offers even more in the summer when you can tour the slopes of the vineyard in a land train. Just remember to bring a designated driver with you, and some means to cart all your purchases away.